What if you could have the convenience of a truck to haul your things around and the fun of driving a sports car rolled into one vehicle. With sports car acceleration and handling, and adding the fuel economy of a V6 you’ll have fun with this pickup. Well, Ford has just announced the new 2014 Ford Tremor that will be available this fall. Ford has put a regular cab on a short wheel base and jazzed it up with FX styling. They then dropped in an 3.5 liter EcoBoost engine to give it the power of a V8 with the V6 economy. Sports truck enthusiasts will be in driving heaven behind the wheel of this new edition to the F-150 line. 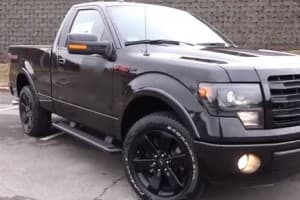 This combination of short wheel base, powerful engine, and a launch-optimized 4.10 rear axle makes this truck the fastest Ford with the EcoBoost engine in their line. The truck sped down the quarter mile track in 14.5 seconds reaching a top speed of 94 mph and accelerated from 0 TO 60 in 6.1. But what else would you expect from 385 horsepower, 420 lb ft of torque, and twin independent variable camshaft timing. The sporty FX package includes 20 inch flat black wheels, stylish body graphics, and black badges with red lettering. The gear shift is mounted on the floor in a unique center console that separates the black leather bucket seats. Red stitching accents the steering wheel while red piping outlines the flame retardant Alcantra seat inserts. Brian Bell, F-150 product marketing manager, points out the Tremor provides distinctive performance in a highly capable performance truck that comes equipped with aftermarket type options. Do you want all this and connectivity as well. No problem. MyFord Touch uses voice activated SYNC with an optimized physical interface that comes standard on the Tremor. The Ford designers have provided easy access to climate controls and audio preset buttons. The new Tremor can be compared to the SVT Lightning or maybe a miniature Raptor but this powerful, stylish truck will be able to make a name for itself in the sports truck category.If you have any thoughts, be sure to chime in below.